VILLAS AND APARTMENTS TO RENT IN L'AMPOLLA, SPAIN. 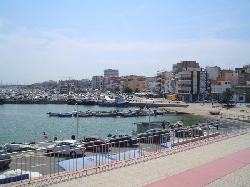 Welcome to our selection of holiday homes to rent in L'Ampolla, Spain. L'Ampolla is a traditional fishing village along the north east coast of the Mediterranean Sea with typical little shops, restaurants and other services. Fish and other seafood are a popular cuisine in the village with many local specialities on offer. The name L'Ampolla means 'bottle' and comes from the shape of how the Ebro River enters the sea. There are various types of beaches to be found in L'Ampolla such those covered in pebbles, small coves, lagoons and also fine golden sands surrounded by red cliffs that have been given the blue flag. Looking for self catering holiday accommodation in L'Ampolla? Then below is a selection of holiday apartments in L'Ampolla and holiday villas in L'Ampolla that can be rented direct from their owners. You can either click on each listing for further details or you can use our search engine on the left if you are looking for something in particular.